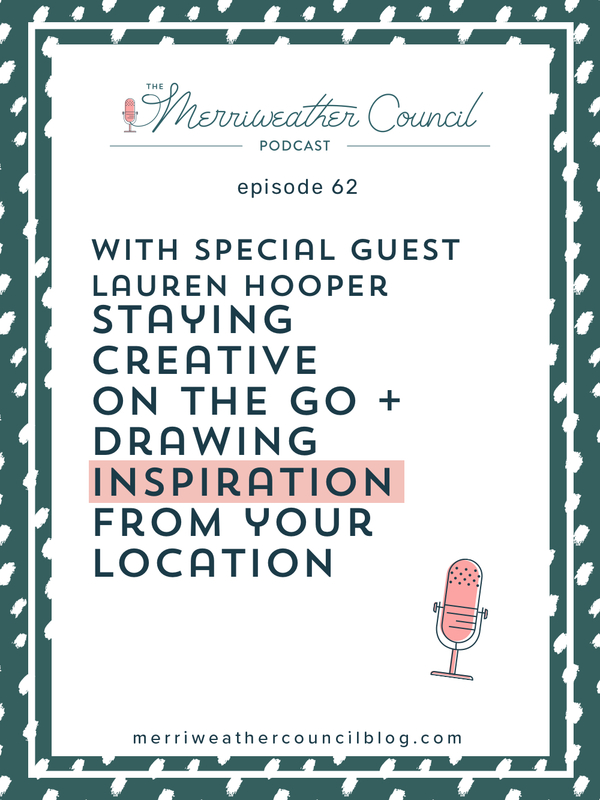 It was a real treat for me to get to speak with Lauren Hooper of Lauren Likes not only for this episode of The Merriweather Council Podcast but also for an episode of her podcast, How She Creates. I’ve been following Lauren online for a few years and she is one of the people I most love to see in my feed. Her blog and Instagram account are colorful, aspirational, and fun! Lauren and her husband are often on travel adventures and it’s just an absolute blast to see where they are headed off to! I love that Lauren makes it a priority to document her travels, and to bring her art practice along whenever she leaves home. I find this so intriguing because when I go on trips, I’m a mess. Can barely remember to bring enough socks let alone a whole bunch of art supply. So I wanted to ask her, how does she do it? What tips does she have for staying creative when you are on the go, or in flux, or your life is in transition. And her answers were great! I can’t wait for you to hear this conversation. I also asked Lauren about her time living abroad, and her 100 day project about her love for Korea, where she and her husband lived recently. Lauren is a true inspiration! Be sure to pop over to Lauren’s blog for even more travel and art goodness and eye candy. The course Lauren and I spoke about on the show, Stories from Here, is the program she built out based on her own 100 day project. And of course, you will absolutely want to follow her on instagram for all the day to day adventures! Thank you Lauren for being a guest on Merriweather Council Podcast.